Snapchat has partnered with Square on a Venmo-like payment feature called SnapCash. 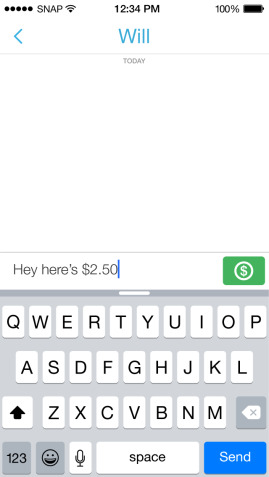 Snapcash lets you quickly message cash to friends once you’ve entered your debit card. All the transactions are handled by Square. This project has been in the works for a while. Snapchat filed a few payment-related trademarks that were made public over the summer. Then, a Business Insider source indicated that Snapchat was working on a peer-to-peer payment solution. Here’s how SnapCash works: Send a private message to a friend like you normally would on Snapchat. Type in a dollar amount. The app then recognises the amount and a green “$US” button lights up. If you want to send that amount, just press the button. Snapchat/RecodeHere’s what Snapchat’s payment feature SnapCash looks like. Snapchat won’t keep your debit card information on file. Instead, Square keeps it all. So Snapchat powers the money message, and Square deals with the messier financials. Sending money over SnapCash automatically turns that person into a Square account holder, so it should help Jack Dorsey’s multi-billion-dollar payment startup onboard the young demographic (teens and 20-somethings) that Snapchat attracts. Venmo, an eBay owned peer-to-peer payments solution, isn’t profitable, so this isn’t a revenue lay-up for Snapchat. Venmo is also popular among college students, so even though Snapchat likely has more users, SnapcCash has its work cut out for it. Today is a big day for us – we are launching our first product created in partnership with another company. We’re huge fans of the folks at Square and have been big admirers of Square Cash since it launched — just type a dollar amount into the subject line of an email and send cash to friends. Genius! The product you’re seeing today is fast, fun, and incredibly simple. After you enter your debit card, it’s securely stored by Square, who will swiftly process your payment and send cash directly to your friend’s bank account. Just swipe into chat, type the dollar sign, an amount (e.g. $US11.25), and hit the green button.